There are a lot of weight loss programs out there to choose from. Whichever you choose, it is important that you understand what expectations are realistic, that you are committed to ongoing self-care, and that you follow the long-term lifestyle recommendations that your doctor makes. Weight loss programs like ChiroThin are not miracle programs. They aren’t intended to take the place of a healthy lifestyle. What they are intended to do, is to help you lose weight quickly in order to regain your health, and eliminate or reduce the symptoms of chronic conditions related to being overweight. We believe that the ChiroThin program is an excellent choice for many of our patients. If we didn’t, we wouldn’t recommend it. However, we know that it is not a cure-all or a miracle product. Anyone who tells you that it is, isn’t being honest. If you want an honest evaluation of your situation and to have a frank discussion about how ChiroThin can help, make an appointment today for a consultation at Superior Healthcare. Meanwhile, we’ve put together some facts for you so you’ll know what to expect and what not to expect if you choose to try the ChiroThin weight loss system under the supervision of our staff. The ChiroThin diet includes a dietary supplement that provides nutritional support and helps your body eliminate fat. When used according to your doctor’s recommendations, it helps stabilize blood sugar, can increase metabolism, and will help your body remove toxins that may be contributing to inflammation. The program, which includes the supplements, lasts for 42 days. Patients tend to lose around 20-to-35 pounds, and you may repeat the program after a waiting period determined by your doctor. Weight loss is usually greatest at the beginning and at the end of the 42-day program, so it is important to be mentally committed to the entire program before starting. You must never skipping a planned meal. Your meals are perfectly balanced to work with the proprietary supplements, and if they aren’t taken as directed, your results will be less than ideal. Can I Trust the Company? Yes. All of the ingredients are sourced from the United States, so you can rest assured that you are getting what you expect. The manufacturing facilities are also based in the United States, and are FDA-certified, which means they are regularly inspected for quality and regulatory compliance. The nutritional ingredients are never sourced from overseas, and they are always the highest-quality, purest ingredients available anywhere. The formula is unique and acts as an appetite suppressant, detoxifier, energy booster, all while protecting your muscles and boosting your immune system. 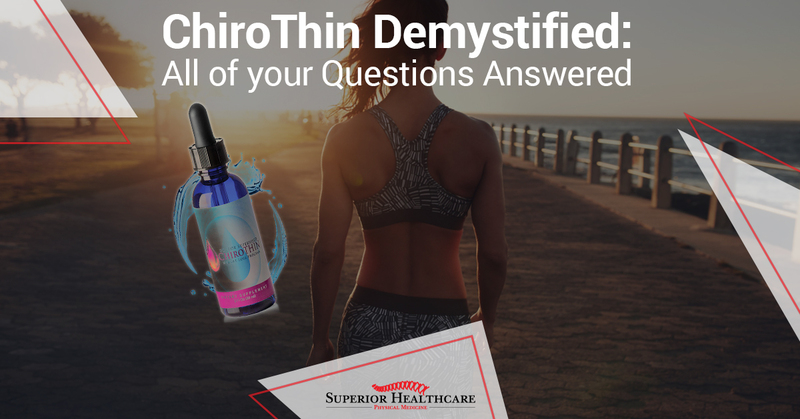 Is ChiroThin The Same Thing as Prescription HCG? No. Prescription HCG is available from doctors but does not include any of the supplemental ingredients included in our proprietary formula. It is those supplemental ingredients that make our program so effective. The amino acids, vitamins, cell salts and other ingredients in our formula provide benefits that you won’t get from prescription HCG. Can Women and Men Us it? Yes. The program provides excellent results for men and women. Often, men will begin experiencing weight loss more quickly than women. You may have heard that when you go on a calorie-restricted diet, your metabolism slows down. This is often called starvation mode. Your body thinks that it needs to conserve fuel, and holds onto fat because it thinks there is a shortage of food. This is a real problem on a lot of diet programs. Our formula is specifically designed to help avoid starvation mode, and help your body metabolize and continue to utilize fat. When properly supervised, the ChiroThin program is going to keep you from going into starvation mode. By going on a low-calorie diet alone, without the supplements, your body is likely to go into this mode so you won’t lose weight as quickly, and you may alter your body’s metabolism, making it harder to keep weight off or lose more in the future. You probably will feel hungry in the first few days that you are on the program. But, because our proprietary formula does such a good job of stabilizing blood sugar and suppressing cravings, that feeling should go away after four to five days. Most people on the program report not feeling hungry and having plenty of energy. Can I Continue Taking My Other Supplements and Medications? Discuss all of your supplements and medications with your doctor so you can determine together if you need to make any changes. There are no known side effects or medication interactions, but you and your doctor should make these decisions together. You should not start the program or take the supplements if you are pregnant. And, if you become pregnant, you should stop the program. If you’d like to learn more, and find out if this is the best course for you, schedule a consultation at Superior Healthcare. We’re conveniently located in Metairie, LA.